A rich history, a rapid developing economy, a charming touristic destination … at least three reasons recommending Azerbaijan as one of the most interesting spots on the Asian map. In the insurance business, beside the significant growth potential, it is worth mentioning the market’s openness to technological progress and international cooperation. The Azerbaijan International Insurance Forum has already became a traditional “landmark” on the industry’s annual agenda. Standing as the most important event in the Caucasus Region, AIIF focuses on the main development trends and perspectives within the Region, offering the best meeting point with the local industry. 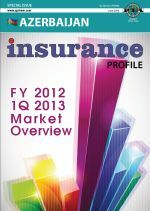 The special issue of Insurance Profile dedicated to Azerbaijan is meant to be an efficient tool in your hands, keeping you updated with the market’s evolution and future prospects, emphasizing the real business opportunities. It is not only about potential, but also about a welcoming business environment and a market whose main players – companies, supervisory authority and association -, are targeting the highest standards.